OK, and now something completely different. 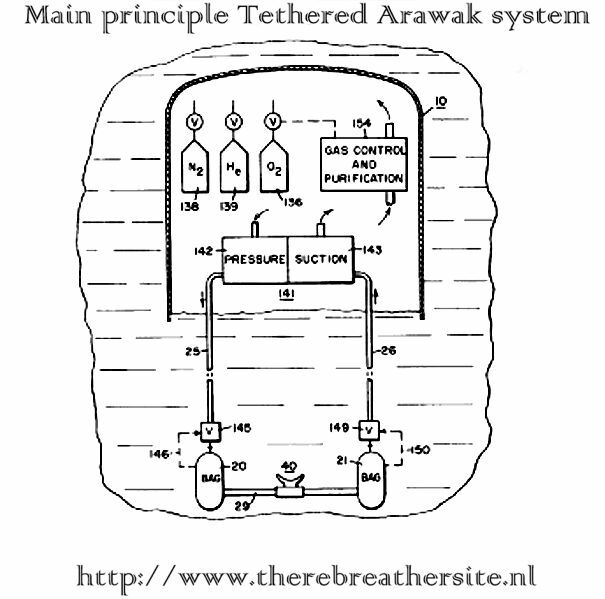 One of the units used for deep diving in the 70"s is called the Tethered Arawak system. It is a pleasure to offer this information to my readers. The Arawak system is a incredible high tech system when the depth involved taken in perspective. The system is used for depth up to 500 meters. Later models like the SLS system and the BOSS system are improved models of this innovative technology. This article could only be made thanks to many people but most of all I want to thank Jan de Groot of Nautiek Diving. Don't hesitate to check his website, by clicking his logo! Diver apparatus includes an inhalation breathing bag and an exhalation breathing bag with a breathable gas mixture being supplied by pressure source to the inhalation bag through the inlet valve. 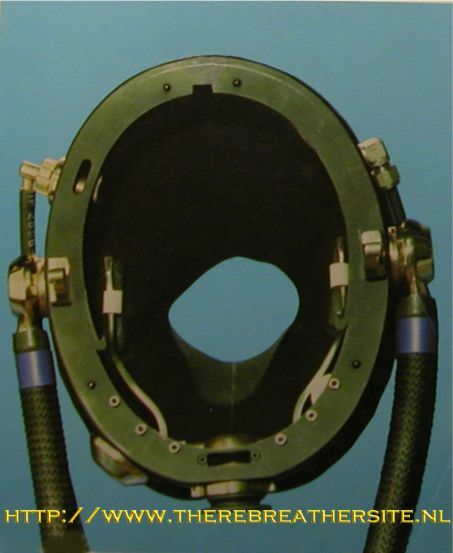 The exhalation bag is connected to a suction source through an outlet valve with the apparatus including a flexible hose connected between the breathing bags and having a suitable mouthpiece and valving arrangement for diver breathing. 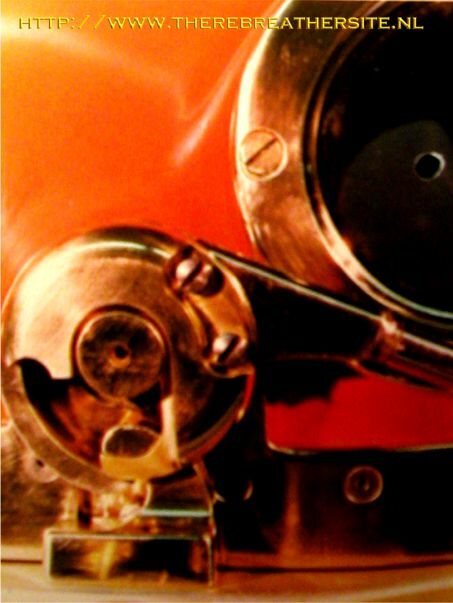 The inlet valve opens up to supply the gas mixture when the inhalation breathing bag collapses due to a diver inhalation or a descent, and the outlet valve opens to allow removal of the exhaled breath when the exhalation breathing bag expands due to an exhalation or an ascent. 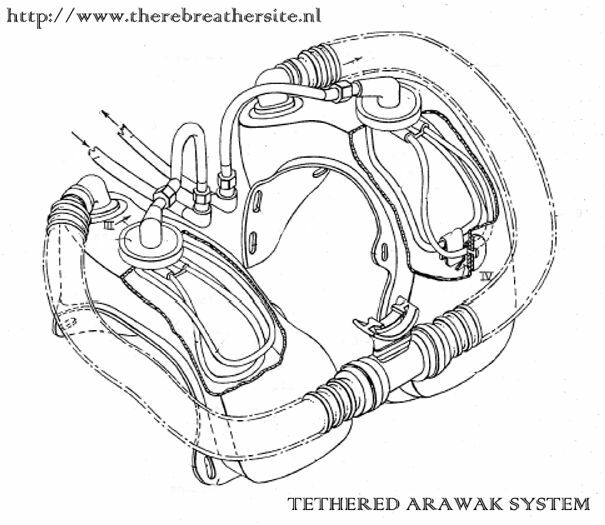 One valving arrangement utilizes wire bales extending within the respective breathing bags an another arrangement utilizes valve chambers with diaphragms having on one side the water pressure and on the other side either the inhalation breathing bag pressure or the exhalation breathing bag pressure. 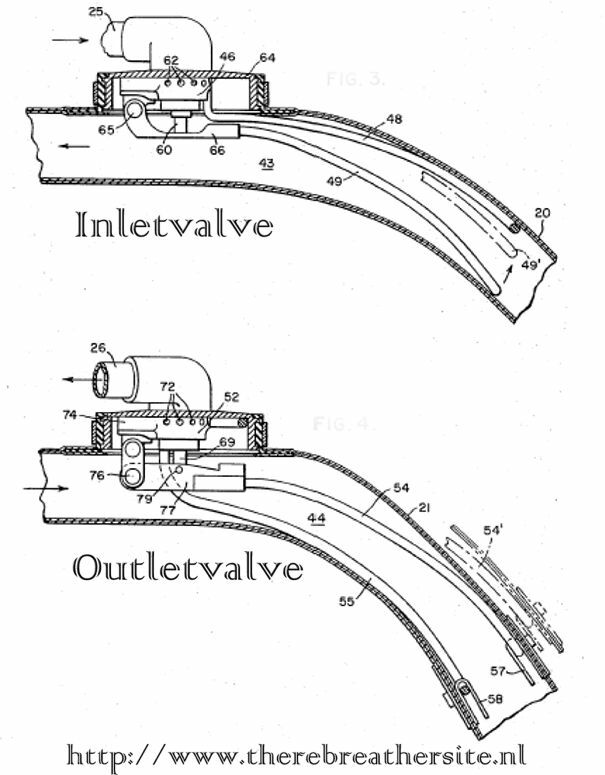 The valves are biased to insure that they are not simultaneously opened. This apparatus is used for lateral, and limited vertical, excursions from subsurface diving bases. Supply and vacuum pumps (compressor-depressor), situated inside the diving habitat, provide chamber gas to the diver and, via a second hose, return it to the habitat for carbon dioxide removal and processing with the atmospheric purification equipment located there. 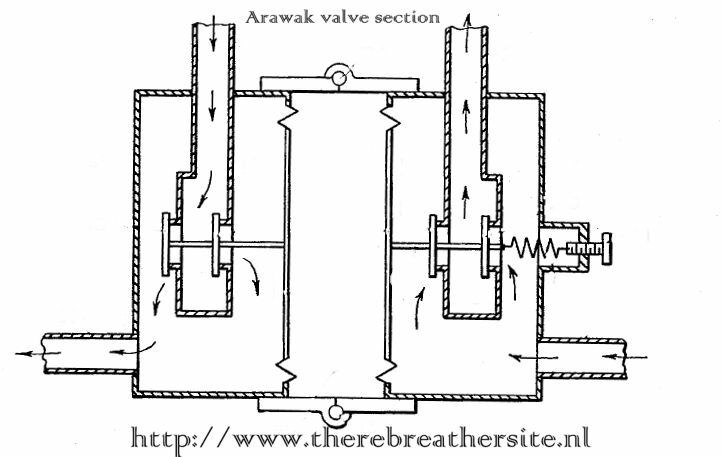 The Arawak gas circuit constitutes a satellite appendage of the subsurface base: it is a rebreathing apparatus without carbon dioxide removal capability, and is a closed-circuit mixed-gas apparatus without self-monitoring devices or automated mixture control. The compensatory advantages which this system provides include the following: simplicity of predive preparation, diver monitoring, and post-dive maintenance; economy in procedurement and operational costs; augmentation of diver safety, conferred both by restrictions implicitly imposed with a tether, as well as by engineering features already mentioned. The system seems to have two backup systems. One of them seem to work as a semi-closed system. Since the goal of the system is to not have the diver wearing a scrubber this seems strange to me. I would like to have the user manual or detailed photos of the system and backpack of the diver. I would like to invite everybody to sent me additional information! Most wanted are actual photos of the divers using this system. 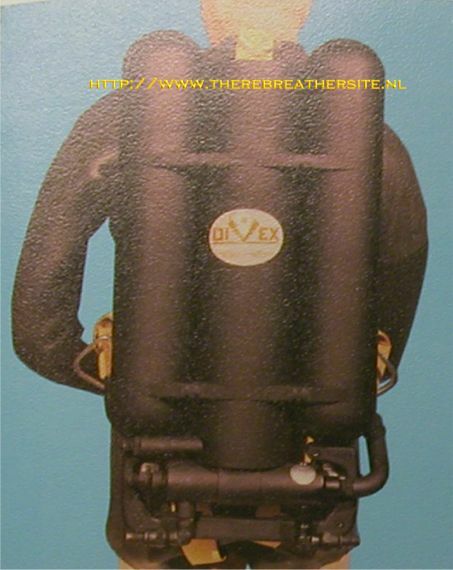 The Divex designed ARAWAK V is a closed circuit (push-pull) diving system that supports the saturation diver in depth of water from 200 to 1,500 feet. (~65 – 500 meter). Using the 15 years of Emerson and Westinghouse closed circuit pump and valving technology recently acquired by Divex as a point of departure, the Arawak V is a advanced closed circuit system designed for commercial use. The first operational application of this push-pull concept was during Sealab I and II in the Arawak I and II equipments. 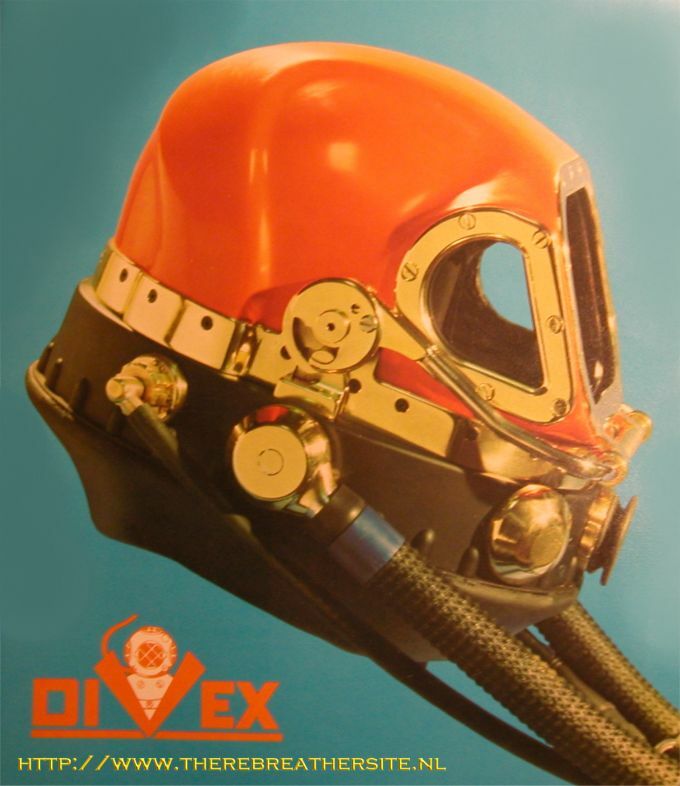 With Divex improvements, Arawak V is a linear descendent of that Arawak family of diving systems. 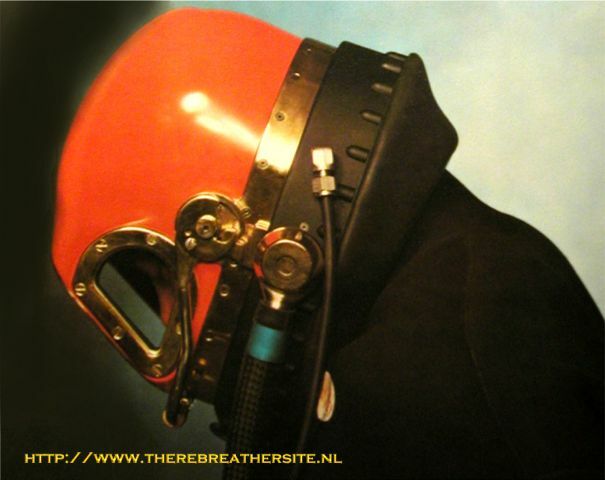 In the Arawak V, breathing gas is taken from the atmosphere of a saturation system, whether PTS or submersible, and pumped to the diver through an umbilical. Diver exhaust gas, in turn, is pumped back to the bell for CO2 scrubbing, reconstitution, and reuse. The system employs gas heating in the supply line. 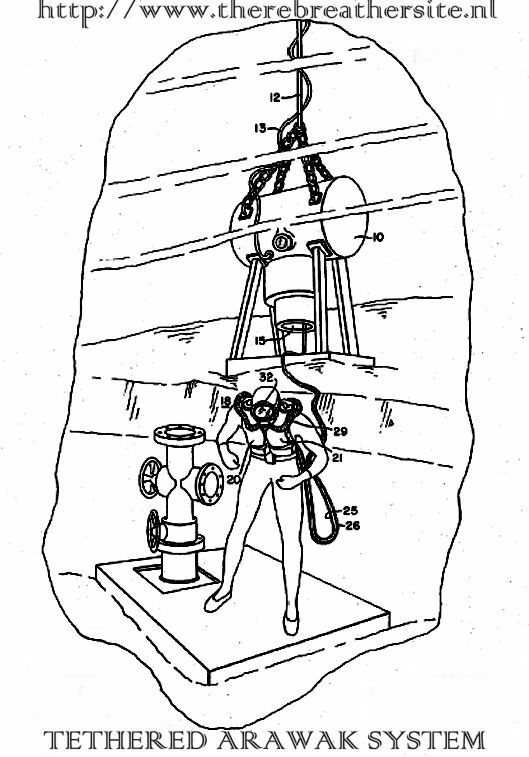 Two independent emergency gas systems are provided. In addition to the supply and return hoses. Major concerns in system design are diver safety, comfort, and mobility. The basic system is configured for one diver, and multiple systems may be employed in a specific application. 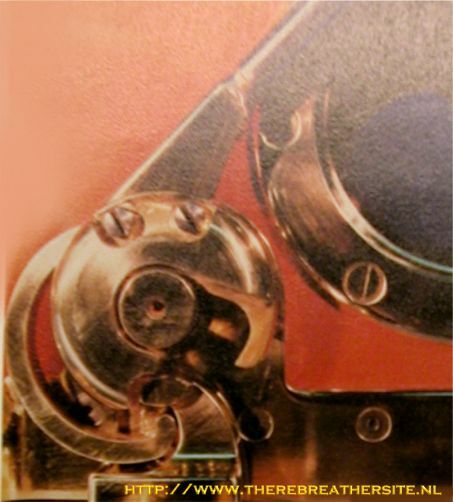 In the pictures to the left and below the ARAWAK V helmet latch mechanism is shown in both the open upper, and closed lower, positions. A single motion of the locking bar will lock the helmet in place. 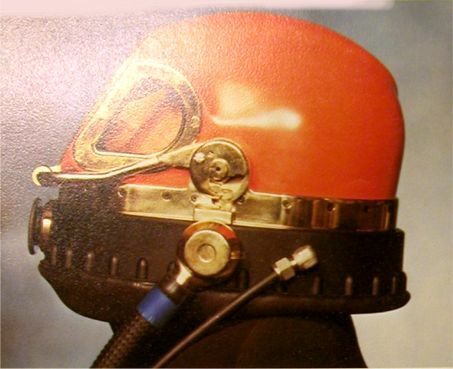 Five distinct actions are required to remove the helmet from the diver, indicative of the safety inspired redundancy built into Arawak V.
In the pictures above the ARAWAK V helmet latch mechanism is shown in both the open upper, and closed lower, positions. A single motion of the locking bar will lock the helmet in place. 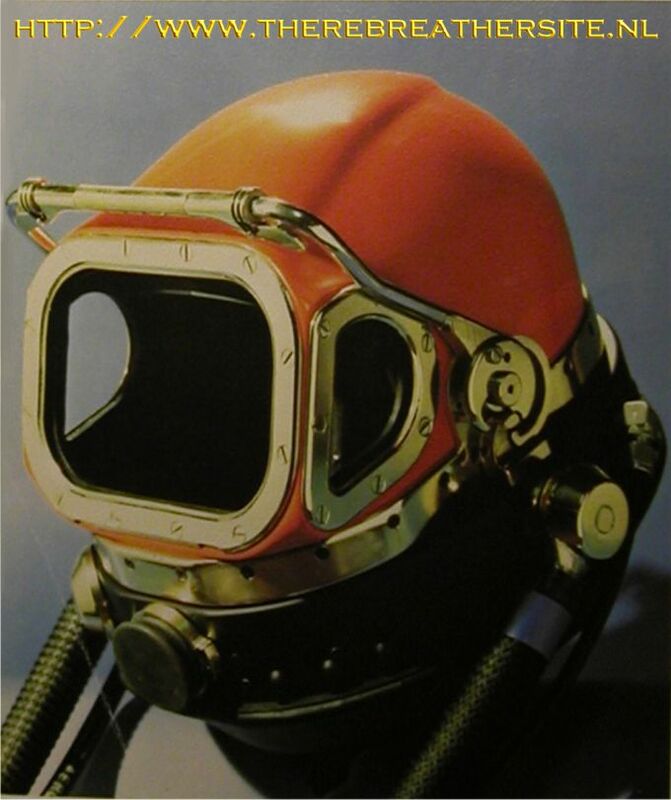 Five distinct actions are required to remove the helmet from the diver, indicative of the safety inspired redundancy built into Arawak V.
The backpack, upper left, includes the exhaust gas accumulator, the emergency bottles, ans a gas heat exchanger. The accumulator acts as a buffer between the return pump and the helmet exhaust system, acting to dampen the exhaust gas flow. The emergency bottles are off-the-shelf components adapted to the Arawak V. A gas heater is included in the system. All valving and swivel fittings are integrated into a single valve ring casting, lower left. The pump module, lower right, is designed to minimize power requirements and package size. The pump module valving and the exhaust gas accumulator in the backpack, working together, reduce exhaust flow requirements. The result is a small return pump and a requirement for less power. The module is normally mounted on the exterior of a PTC for space, noise, and cooling considerations. IMAGINE DIVING @ 500 METER!